When 13-year-old Wanderson Pinales arrived in Boston from the Dominican Republic in 2010 to start a new life, he knew little English beyond “baseball.’’ He landed at English High School, where nearly half his class would fail to graduate in four years. In baseball terms, Pinales had two strikes against him. Today, Pinales is a college-bound honor student, an All-Star baseball player, and one of thousands of students who have benefited from the Scholar Athletes program, a multimillion-dollar nonprofit that Suffolk Construction magnate John Fish launched in 2009 to address chronic deficiencies in Boston’s school athletics system. Six years after Fish stepped into the void left by the city’s years of underfunding and neglect of school sports, Scholar Athletes has grown into something remarkable, a system of tutoring centers, called Zones, in 20 high schools helping students sustain their academic eligibility for team sports and prepare for the possibility of college. Fish has personally donated $6 million to the program. A look at the state of high school sports in the city of Boston. It was touted from the start as a public-private partnership in which Fish and other business leaders would contribute in a big way and the city, too, would do much more. But the city has yet to step up its game. For more than a decade, Boston’s budget for school athletics has largely remained stagnant at about $3.2 million, a sliver of the $975 million school budget for 2015. The range of sports offerings is stunted, and staffing is minimal. 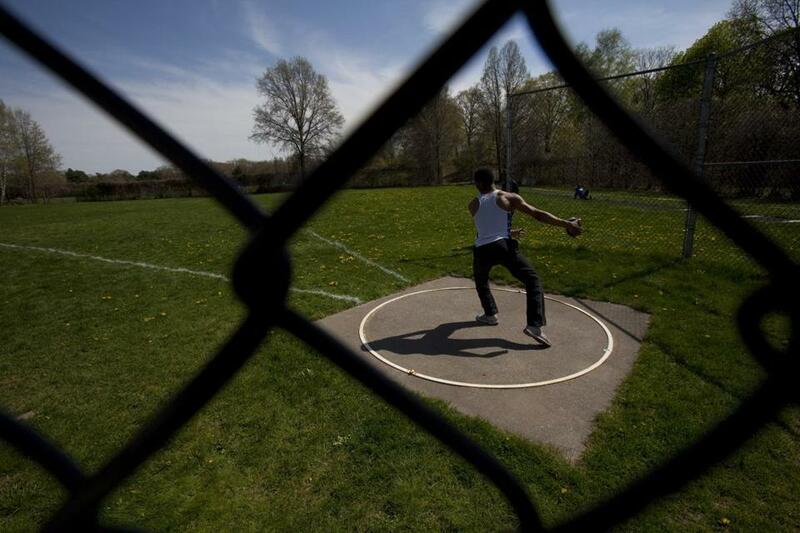 Last year, the city spent $75 per student on athletics, less than half the state average of $154, according to the Massachusetts Department of Elementary and Secondary Education. 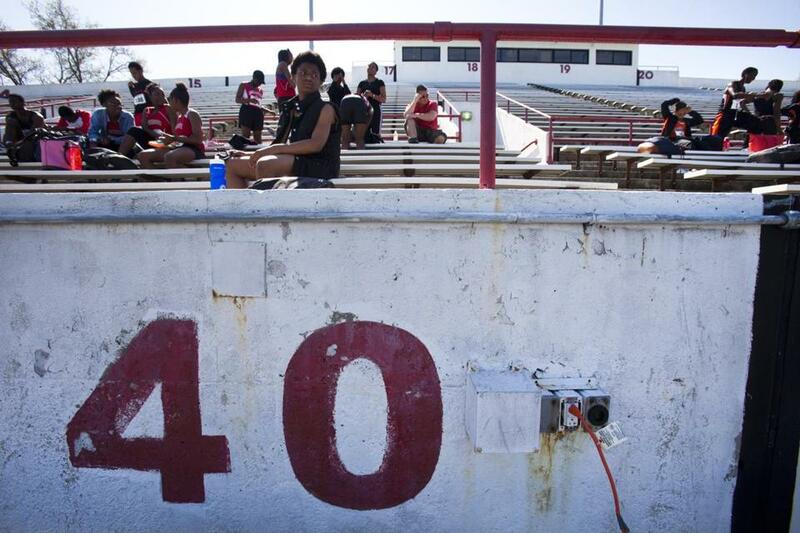 Consequences abound, from low participation to substandard facilities, perhaps best exemplified by the system’s antiquated centerpiece, 70-year-old White Stadium in Franklin Park. 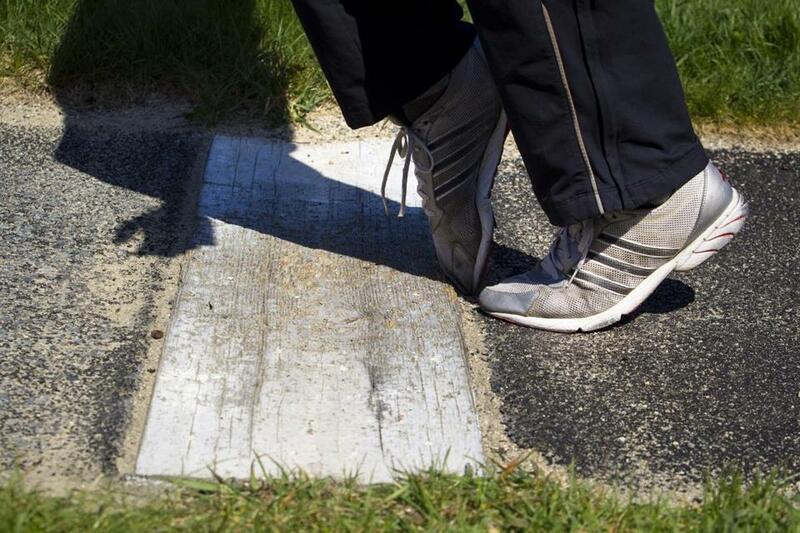 A student athlete demonstrated how easy it is to trip on the long-jump runway at White Stadium. “The Scholar Athletes program has done incredible things for us, but the city still has done nothing,’’ said Brian Leussler, who has coached track and field at Boston Latin Academy for 14 years. All told, only 27 percent of Boston high school students participated in interscholastic athletics in 2013-14, compared with nearly 77 percent participation statewide, according to the most recent survey by the Massachusetts Interscholastic Athletic Association. The figures in Boston remain virtually unchanged from six years ago. City officials said the school athletics budget, which has grown by only about $400,000 since 2005, has been buttressed by nonprofits such as Scholar Athletes in the high schools and the Play Ball! Foundation in the middle schools. Fish, who last year began spearheading Boston’s bid to host the 2024 Summer Olympics, joined with then-Mayor Thomas M. Menino to create Scholar Athletes in response to a Globe series on widespread problems in the school sports system. Boston’s four major professional sports teams have joined other civic institutions and leaders in bolstering Fish’s donations with an additional $10 million. In its early years, Scholar Athletes, in addition to developing the Zones, stabilized Boston’s underfunded system by providing many teams with such essentials as uniforms, equipment, and coaching clinics. But Fish has since concluded he can best serve the city by providing educational enrichment to student athletes, leaving it to the school department to address other basic needs as its traditional spending responsibility. Academic ineligibility has long ranked among the greatest barriers to sports participation in the Boston schools. School officials credit Scholar Athletes with helping to boost grades, SAT scores, and college admissions among sports participants. By most accounts, fewer student athletes are sidelined by academic ineligibility, fewer games are forfeited for lack of eligible players, and more hope is coursing through the system. Yet many workers on the front lines believe the city needs to do more, and some are challenging Fish and Mayor Martin J. Walsh to address the deficiencies, particularly as Boston makes a bid to become the site of the 2024 Summer Games. A city that seeks a leading place in the world of sports competition, they say, should also find a way to do right by its public school athletes. Many school athletes in Boston walk more than a mile or ride the T to their practice facilities, some of which are second-rate at best. Many practice facilities are second-rate at best. Pictured: White Stadium. For other athletes, seeking any place at all to practice can prove fruitless. Because Fenway High School has no sports facilities, the girls’ basketball team commutes four days a week to different locations in the South End, Roxbury, and Jamaica Plain. But because no gymnasiums are available to them on Wednesdays, the Fenway girls sit idle while other teams practice. Still, the Fenway girls have won two state championships in the last four years, and their star, Jalissa Ross, is one of the few Boston student athletes in recent years to receive a full athletic scholarship to a Division 1 college. She plans to play for the University of Rhode Island. At Jeremiah Burke, the baseball team hikes more than a mile from Grove Hall through the volatile Bowdoin-Geneva neighborhood to its field at Ronan Park, where it is not rare to hear gunshots. On spring days when the field is unplayable and the Burke gym is occupied, the team practices on a nearby parking lot, after Duhaime has swept off the broken glass. Still, there are injuries. “These young people deserve so much more,’’ Duhaime said. He gets no argument from Fish. The outdated White Stadium hosts scores of school football, soccer, and track and field events each year, and is home to the city’s athletic department. In 2013, Fish pledged an additional $5 million to partner with Menino and the city on a $45 million renovation and expansion of the stadium. But Walsh has tabled the project, citing budget priorities. The setback raised concerns that Fish had lost some of his influence at City Hall, possibly threatening the future of Scholar Athletes as well as the stadium project. Walsh said in an interview that he has supported Scholar Athletes since he ran the Building and Construction Trades Council and raised money for the program. As mayor, he has appeared at Fish’s Scholar Athletes fund-raisers and visited many of the program’s 20 learning centers. For years, the Boston schools athletic department has needed all the help it can get. With a bare-bones budget, the staff of six full-timers faces the formidable task of managing coaches, game officials, athletic trainers, scheduling, security, transportation, equipment, medical exams, injury reports, and academic eligibility, among other challenges, for 20 high school complexes and 22 middle schools. The city added $300,000 to the budget this year to help Scholar Athletes fund part-time athletic coordinators at each high school complex. But the system’s greatest support has come from nonprofits such as the Play Ball! Foundation, which since 2009 has spent more than $2 million in the woefully underserved middle schools to establish programs in football, baseball, boys’ and girls’ soccer, girls’ volleyball, ice hockey, and double Dutch. Still, the foundation serves only a fraction of the city’s middle school students and reports having a long list of teams waiting for funding. 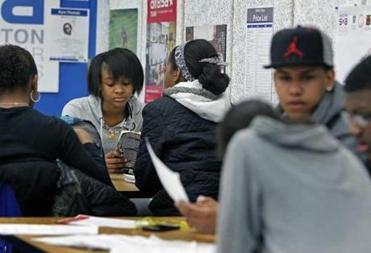 The picture is only a bit less bleak in Boston’s high schools. No student in the city has access to some sports that are routinely funded in surrounding communities, such as lacrosse, field hockey, and golf. And most students in Boston’s two-tiered high school system lack access to a broader range of sports opportunities that are available at the exam schools: Boston Latin School, Latin Academy, and the O’Bryant School of Mathematics and Science. The city offers cooperative high school programs in sports such as tennis, swimming, wrestling, cross country, and hockey, allowing students to join teams at other schools. But many students are daunted by the prospect of commuting to compete for unfamiliar schools in unfamiliar places with unfamiliar teammates, and participation rates are typically very low. Many students are daunted by the prospect of commuting to compete for unfamiliar schools in unfamiliar places with unfamiliar teammates. This year, the co-op tennis programs offered by Latin Academy and O’Bryant drew no students from other schools. And participation was so low in many high school sports across the city that less than 40 percent of the 173 varsity programs fielded junior varsity teams. The city’s second-year athletic director, Avery Esdaile, professed optimism and cited boosting participation as one of his top priorities. He has a powerful ally in the Scholar Athletes program, whose $4.2 million budget for the Boston schools funds a full-time staff of 44, including nearly 30 college-educated tutors in the Zones. The academic staff speaks multiple languages and provides extra individual attention that struggling student athletes might otherwise not receive. “If there was no Zone, I wouldn’t do my homework because my mom doesn’t speak English and I would have to try to figure it out myself,’’ said Oumou Bah, a junior at English High who spoke little English when she immigrated from Guinea in 2011. Bah said she was so intimidated as a freshman by students teasing her about her limited English that she declined to try out for soccer, despite considerable experience. “Then as a sophomore I started playing soccer and participating in Scholar Athletes, and I felt like I had a family in America for the first time,’’ she said. As she gained confidence this year, Bah decided to try basketball. She was one of four girls who turned out for the basketball program in a school of nearly 560 students — a sign of the challenge Esdaile faces. By midseason, the English girls’ roster grew to 12, she said, but then shrank to five. With so few players, Bah appeared in every game, and she was named the program’s most valuable scholar-athlete. Now, she is playing softball for the first time, and, like student athletes across the city, she visits the academic Zone daily. Many high school coaches have helped increase academic eligibility by canceling sports practices at least once a week and leading their teams to the Zones for study sessions. Kevin Glynn, English’s assistant baseball coach, said Scholar Athletes has, over the last five years, helped at least 15 of his players attend college — students who otherwise would not have pursued higher education. “This is the best thing that has happened to Boston high school sports in quite a while,’’ Glynn said. Scholar Athletes expects to provide or leverage more than $15 million in scholarships over the next 10 years to schools such as the University of Massachusetts, Boston College, and Suffolk University. In the English High Zone room, Pinales was receiving help writing essays for scholarship applications. 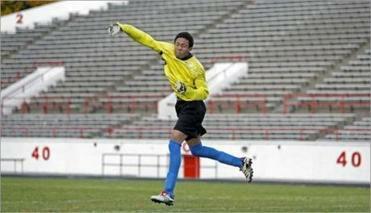 He has been accepted at Fisher College in Boston, the College of St. Joseph in Vermont, and Mercy College in New York. Marissa Rodriguez worked with student-athlete Wanderson Pinales at English High School earlier this year. Marissa Rodriguez, a multilingual tutor in English High’s Zone room, dedicated herself to Pinales, who now counts “Jane Eyre’’ among his favorite books and plays trumpet in the school band. Yet Scholar Athletes still has ground to gain, as many prospective student athletes remain sidelined by low grades. 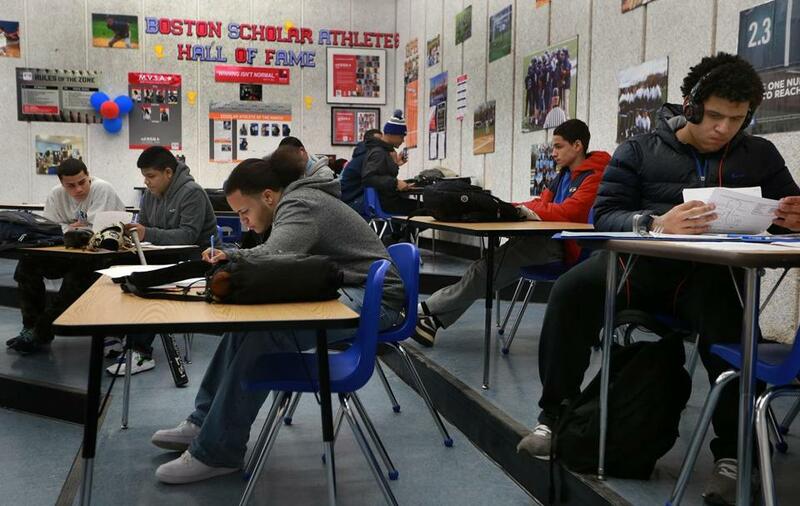 Boston schools require minimum grade point averages ranging from 1.67 to 2.00 for athletes. To reach at-risk students, Scholar Athletes has helped launch an intramural high school sports program aimed at engaging the academically ineligible and others in both athletics and the Zone centers. To date, more than 500 students have joined. Fish’s team also has boosted participation by arranging with Boston University and Boston Medical Center for doctors to provide free preseason physical exams for students in their schools. Many students had previously dropped sports for lack of convenient access to the mandatory physicals. Despite shifting most of its spending from sports to academics, Scholar Athletes continues to fill other gaps. In March, when two track and field athletes qualified for the national indoor championships in New York but lacked the money to attend, Fish’s program helped the city fund their trip. Those athletes are now competing in spring track and field, often at White Stadium. 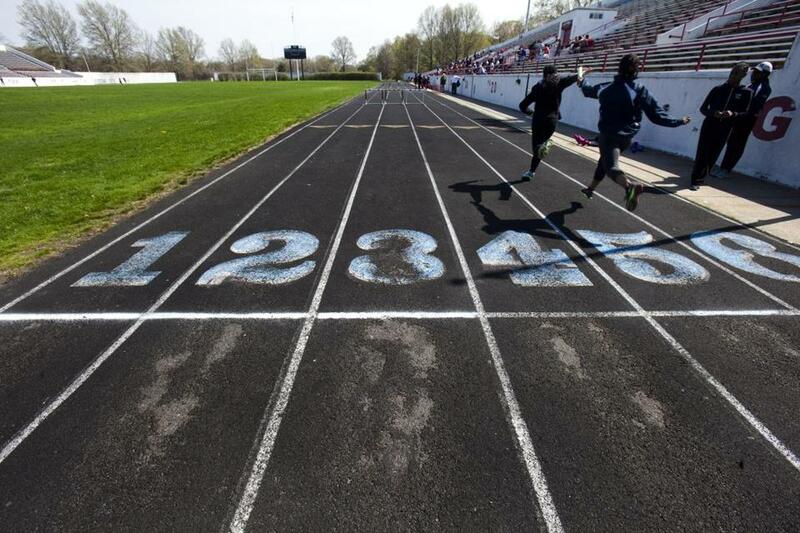 Leussler, the Latin Academy coach, has spent hours there trying to mend the aging track so those athletes and hundreds of others might avoid injuries. “It’s a dangerous situation,’’ he said. In March, when two track and field athletes qualified for the national indoor championships in New York but lacked the money to attend, Fish’s program helped the city fund their trip.